Interim Superintendent Laura Perille conferred with School Committee Chairman Michael Loconto at a meeting last month. Ten parents, educators, and other community leaders have been nominated to serve on a panel charged with finding a new superintendent for the Boston Public Schools. The School Committee will vote on the panel’s membership at its meeting next Wednesday. 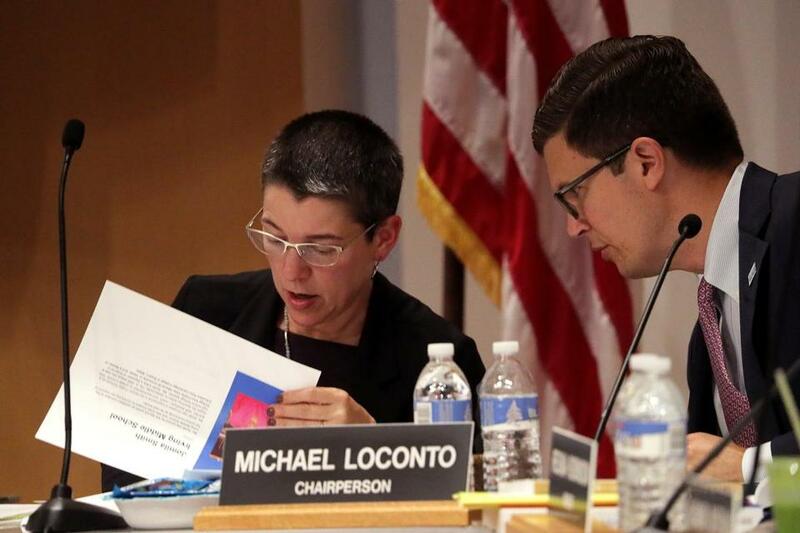 The Mayor’s Office released the list Thursday after School Committee chairman Michael Loconto shared the information with Mayor Martin J. Walsh. The goal is for the panel to recommend finalists to the committee in early winter. The prevailing candidate will replace Tommy Chang, who resigned in June after he and Walsh decided to part ways. “The role of Superintendent of the Boston Public Schools is one of the most important in our city, and I am pleased that School Committee is moving forward,” Walsh said in a statement. The system is being temporarily led by Laura Perille, former chief executive of the Boston nonprofit EdVestors, who has not disclosed whether she will seek the post permanently. The search panel will be chaired by Alexandra Oliver-Dávila, a School Committee member and head of Sociedad Latina, and J. Keith Motley, former chancellor of the University of Massachusetts Boston. The other members are: the Rev. Samuel Acevedo, executive director of the Boston Higher Education Resource Center; Carlos Brown, a parent leader at Guild Elementary School in East Boston and is a teacher in the Wilmington Public Schools; Tanya Freeman-Wisdom, headmaster of her alma mater, the John D. O’Bryant School of Mathematics and Science in Roxbury; Katherine Grassa, principal of the Curley K-8 School in Jamaica Plain; Carolyn J. Kain, chairwoman of Boston’s Special Education Parent Advisory Council; Craig Martin, principal of the Michael J. Perkins Elementary School in South Boston; Michael D. O’Neill, School Committee member; and Jessica Tang, Boston Teachers Union president. Loconto said he is planning to add a student to the panel.